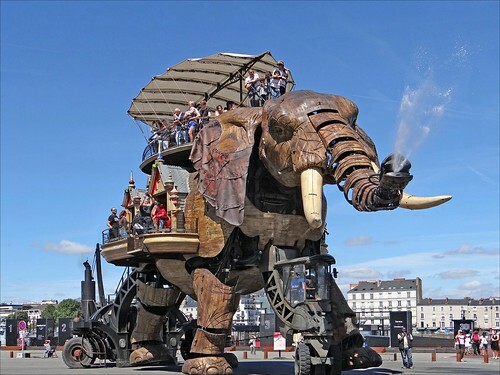 In the early 2000s the city of Nantes, France, decided to create an art installation and amusement park called "Les Machines de l’île" on the site of a former shipyard. 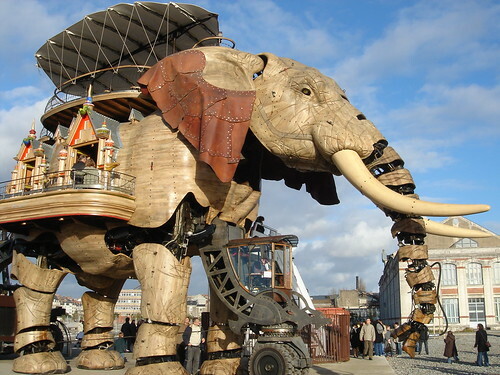 The amusement park tries to depict Jules Verne’s "invented worlds", the mechanical universe of Leonardo da Vinci, and of Nantes’ industrial history. One of major attraction of this amusement park, completed in 2007, is a giant Mechanical Elephant inspired by Jules Verne’s novel "The Steam House", in which British colonists travel through India in a house on wheel pulled by a steam-powered elephant. It is believed that the basic design may also have been inspired by the famous Lucy the Elephant in Margate City, NJ, USA (built 1882) and The Sultan's Elephant (which no longer exists). 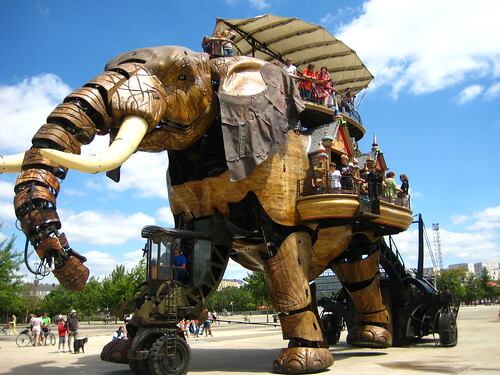 This giant elephant called Le Grand Éléphant is 12 metres (40 ft.) high, 8 metres (26 ft.) wide and 21 metres (70 ft.) long. Made of steel and wood, it weighs 48.4 tonnes (53 tons). The body of the elephant has an indoor lounge with French doors and balconies and a terrace accessible via stairways. It is powered by a 450 HP motor and carries 49 passengers on its back. It's movements are set in motion by gears and 62 cylinders; 46 hydraulic, 6 pneumatic and 10 gas-powered. While in motion it flaps its leather ears, moves its trunk and occasionally sprays water through the trunk on the unsuspecting observers. The movements of the elephant are controlled by its Mahout sitting in a cabin between its forelegs.